100 Meters of 5050 SMD strip LEDs will require roughly 120-200 amps. However, you cannot drive a 100 meter strip from a single power supply. The thin copper traces in the LED strip can only handle so many amps before they become too hot (your LED strip would melt like ice cream on a hot summer day). This is why led strips are usually limited to 5 meters (~5A). You would need separated strips and power supplies for the 100 meters worth. 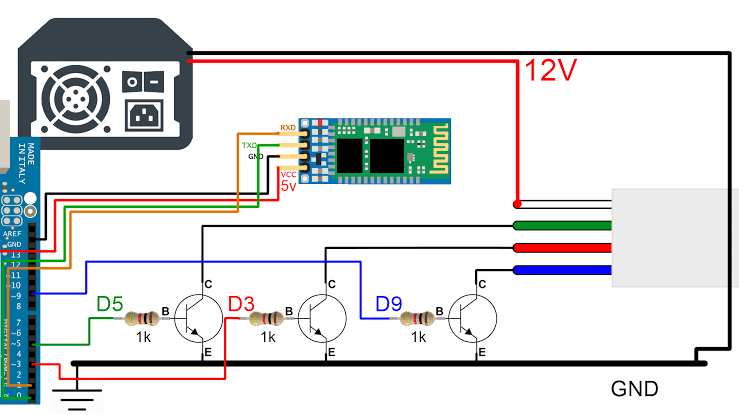 You have the correct idea with your circuit for turning the leds on/off (in fact the wiring is correct) but the transistors you plan on using are the wrong type. To switch the LEDs to ground you would need a low side switch, which would be a NPN transistor. Be careful however, transistors typically switch currents less than 1 amp. For higher power applications I would suggest using a N-channel Mosfet. A quick search on Sparkfun turns up the FQP30N06L, which is capable of handling 30A (with a heatsink, probably less than half without), and is also logic-level, meaning it can be driven with a 5 volt source (Arduino I/O pin). Keep in mind, whatever current your LED strip draws, the ground switch (NPN transistor, N-Channel MOSFET, relay) must be able to handle the same current. Good luck with your circuit! Not the answer you're looking for? Browse other questions tagged arduino-uno power rgb-led led-strip arduino-uno-smd or ask your own question.